Misty Adams enlisted in the Army on June 20, 2017. 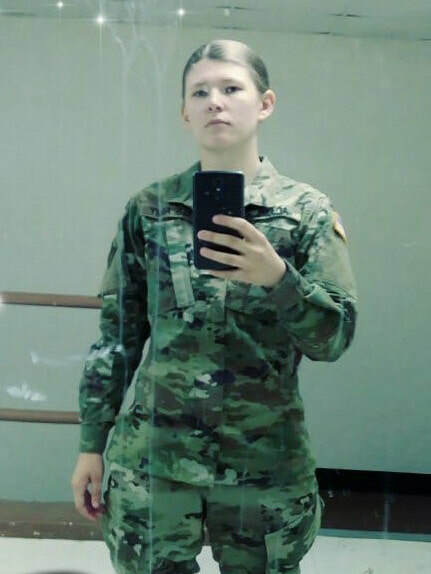 She received her basic training in Colorado and South Carolina, jockeying between both locations until her training was complete. Since graduating, Misty has been deployed to Afghanistan, where she is currently. She is expected to return from her tour of duty in 2019. We adopted Misty at the age of eight years old, into our extended family, which has opened its arms to several other deserving children. Today, we are so proud of the choice Misty has made to join the Army and support this country, while at the same time endeavoring to enhance her own future with a clarity she hopes to find along the way. We are thankful that God gave her to us and are so blessed to have her in our lives. After living in Long Beach for four years, we moved to Lakewood, where we have resided for the last eight and a half years. Misty attended Mayfair High School.